Mother Olga of the Sacred Heart, the founder and mother servant of the Daughters of Mary of Nazareth, delivered a lecture at Christendom College on Monday, March 25, the Solemnity of the Annunciation, speaking on the topic, “With the Church, For the Church, In the Church.” During her talk, Mother Olga challenged the Christendom community to stay in love with the Church, no matter what evils might befall her, and to always be willing to help those in dire need of Christ’s love. Over the course of her talk, Mother Olga told the story of her journey to the Catholic Church. 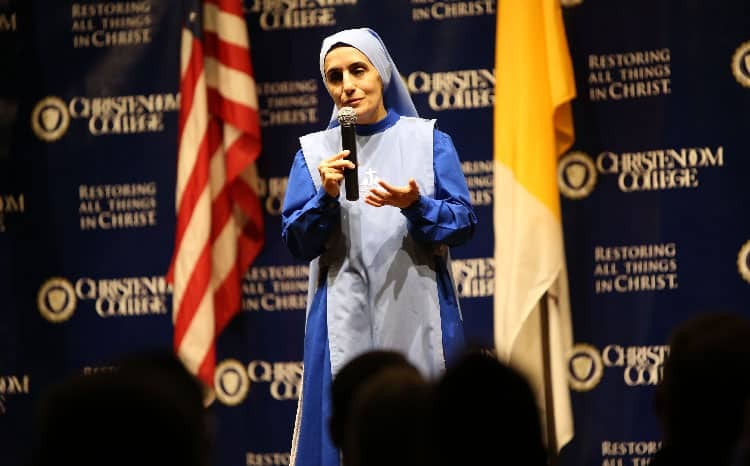 Born in Iraq and the survivor of four wars in the Middle East, Mother Olga was a sister in the Assyrian Church before coming to Boston University in 2002 to get involved with campus ministry. She came into the Catholic Church in 2005 in the Archdiocese of Boston and was given permission to start a new religious order in 2011. The needs that brought about Mother Olga’s order, the Daughters of Mary of Nazareth, are within the Archdiocese of Boston. 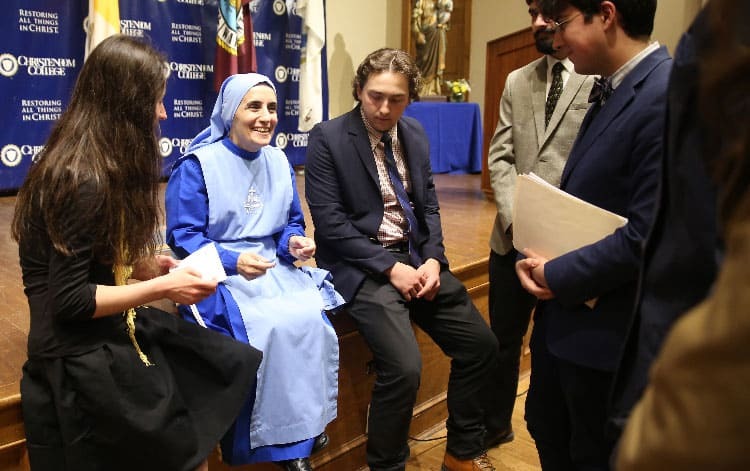 Mother Olga related her own time helping abuse victims, drug addicts, and those in prison, encouraging students to be willing to help all those who need it. Mother Olga went further, telling students that the Church is not a political party, but instead is built on tradition. Political labels cannot apply to the Church, according to Mother Olga, because that would narrow the Church and its mission. Mother Olga closed her talk by entreating students to love the Church more deeply every day and to go out and restore all things in Christ. Watch the video below to see Mother Olga’s talk in full.